JT Miller has shown that he is ready to play at the NHL level, impressing coaches in his first four game since being recalled. After sitting out on Monday against the Penguins with neck spasms, Chris Kreider was back practicing the team on Wednesday. However, he did not reclaim his spot on the second line just yet. JT Miller remained on the second line alongside Derek Stepan and Martin St. Louis. JT Miller took advantage of his opportunity as a top-six forward against the Penguins, scoring the first goal of the game and playing over 14 minutes of ice time. Miller has played extremely well since being recalled from Hartford. In four games since his return, Miller has two goals and an assist, and has looked very comfortable. One change has been the position that Miller has been playing. 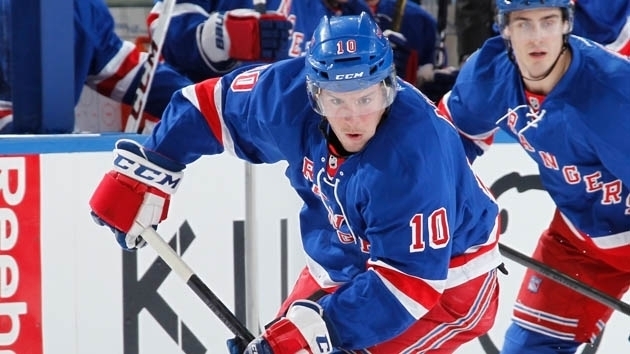 When the Rangers had previously used him, like at the beginning of this season, he was playing center. He is now playing on the left wing, which is his natural position, and has looked much better on the wing. I would expect Miller to remain in the lineup. Miller has added a scoring touch to the Rangers bottom line, and played well with Stepan and St. Louis. With how he has played in the past four games, Miller deserves to keep his spot, and prove that he can keep up the scoring. I also expect Kreider to stay in the lineup, but may be demoted to the third line. 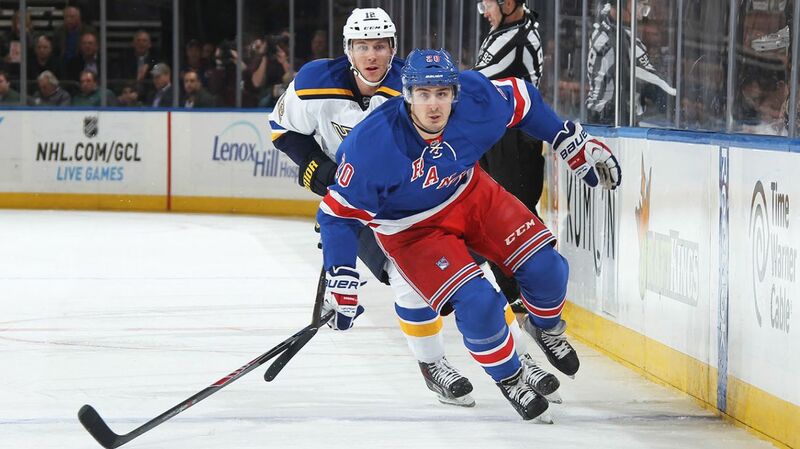 Stempniak, Glass, and Fast could all be removed for Kreider to play. Chris Kreider practiced as an extra on Wednesday, with JT Miller keeping his spot on the second line. i don’t think Kreider will be a healthy scratch on Saturday, but he may wind up playing on the third line while Miller gets another chance to prove himself on the second line. Photo courtesy of MSG Photos. The Rangers traveled to Canada today, and will practice tomorrow in preparation for the game against the Vancouver Canucks on Saturday. They will also play on Sunday against the Edmonton Oilers. Although the Canucks are a good team, this weekend is a good opportunity for the Rangers to establish some consistency. One problem the Blueshirts have had is stringing together wins and getting scoring from all over the ice. The Canucks have a good goalie in Ryan Miller, and the top line of the Sedin twins and Radim Vrabata is as good as any line in the NHL. But if the Rangers play at their best level, they can beat the Canucks and travel to Edmonton for what should be an easy game. Posted on December 12, 2014, in Rangers Updates and tagged Alain Vigneault, Anthony Duclair, Carl Hagelin, Chris Kreider, Dan Boyle, Dan Girardi, Derek Stepan, Derick Brassard, Dominic Moore, Henrik Lundqvist, Jesper Fast, John Moore, JT Miller, Kevin Hayes, Kevin Klein, King Henrik, Madison Square Garden, Marc Staal, Martin St. Louis, Mats Zuccarello, Matt Hunwick, MSG, New York Rangers, NHL, NHL 2014-2015 Season, NY Rangers, NYR, Rangers Nation, Rangerstown, Rick Nash, Ryan McDonagh, The Duke, The Ranger Zone. Bookmark the permalink. Leave a comment.